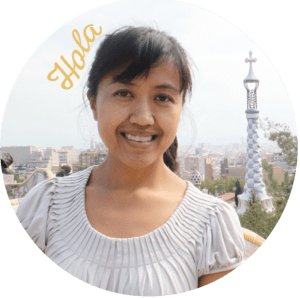 In 2008, when I first moved to Sant Antoni, a neighborhood in the Eixample district (pronounced ‘eshampla’) of Barcelona, I was overwhelmed by the endless blocks and blocks of buildings. And on each block, everything looked the same – fruit stands, bakeries, supermarkets, banks, then more fruit stands, more bakeries, more supermarkets, and more banks. Barcelona urban planning seemed boring. 1. Eixample is 520 city blocks of parallel and perpendicular lines. 2. Each city block has chamfered corners, or xamfrà. 3. All the blocks are oriented northwest-southwest for maximum solar access. 4. The buildings were supposed to be as tall as 16 meters in height as to not block the sunlight for other buildings. 5. The original plan was to have two parallel sides of the block built up. 6. And the interior of the blocks was supposed to have an inner courtyard. 7. Today, in 2019, Barcelona has superblocks, designated spaces almost exclusively for public use. Modern-day metropolitan Barcelona. Photo by Wikimedia Commons. In the mid-1800s, Barcelona was a smaller, very dense area surrounded by walls (Ciutat Vella). With rabid congestion, increased epidemics and a high mortality rate, it was time to create urban solutions for healthier, more livable conditions for the people. 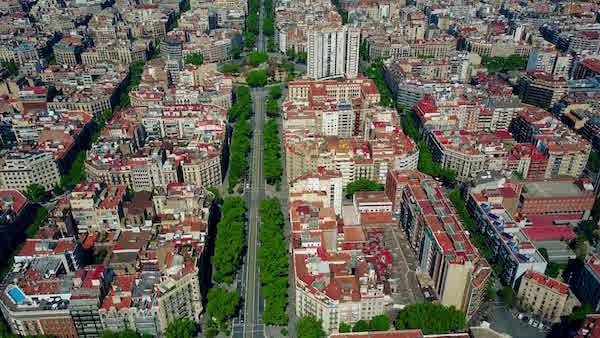 City developers were looking to create the “Eixample” of Barcelona, which in Catalan, translates to “extension”. The godfather of Eixample’s city grid is urban planner Ildefons Cerdà. He believed in healthy everyday living through basic needs — among those are sunlight, ventilation, greenery, and ease of movement. The uniformity and continuity of squares were designed to eliminate segregation of all neighborhoods. Cerdà believed in sanitary conditions for all social classes. 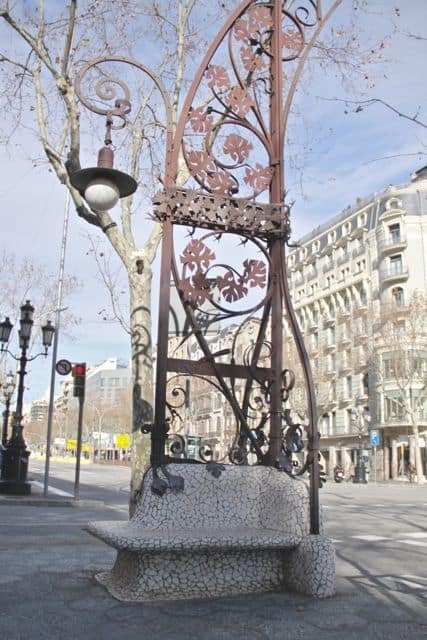 It didn’t transpire that way — an aristocratic residential space was emerging around the Passeig de Gracia area, and a hierarchal structure was being set. Today, Passeig de Gracia continues to be expensive real estate. Critics of Cerdá’s plans claimed the uniformity was too monotonous. Buildings look identical and no outstanding structures as a landmark existed. These quadrangular blocks with shaved-off corners serve a purpose. The 45º angle was determined by the degree that a steam tram was able to turn. It also eases fluidity of traffic as cars don’t need to slow down as much and allows a more comfortable turn for drivers. Perhaps the disadvantage is for pedestrians. 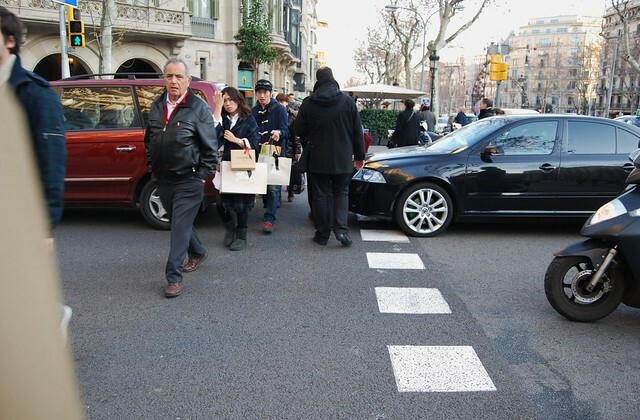 The placement of crosswalks obliges the walker to zigzag a street instead of going down one straight line on a street. The buildings are faced in a way to get excellent exposure from of the sun. Below, the images in the two columns on the right represent street intersections in the winter and summer and how the sun hits the buildings. You can see they gets more sunlight than on the left-hand images, where the intersections lie north-south. Columns 1&2 = little sunshine. Columns 3&4 = lots. Below, the yellow parts in the image below represent sunlight and how it moves in a counterclockwise position during the daytime. Twenty meters between the blocks also provide ample space for light to pass through. The benefits reaped in the winter are more light for daily activities and insulation of buildings, which means energy savings. In the summer, shadows are cast into all the streets, cooling down the city. And let’s not forget the psychological benefits of the glorious sunlight. Originally, buildings were supposed to be constructed until the height of the yellow square as shown above. The sunlight would penetrate all the buildings, including the bottom floor. Cerdà’s plans were ignored. Buildings rose up to 24 meters, blocking the air and sunshine that was supposed to circulate. As seen in the first image, the block was supposed to be built only on two sides. Having this space ensured ventilation and sunlight, enabling more than 800 meters of green area in between. Throughout time, you can see the constructed development of the city block — many became completely enclosed. These would have served to be shady, intimate, recreational open space for the neighbors. Today, the interiors consist of workshops, shopping centers and car parks. There exists a few surviving interior garden community areas and swimming pool such as Jardins de la Torre de les Aigües and Casa Elizalde. 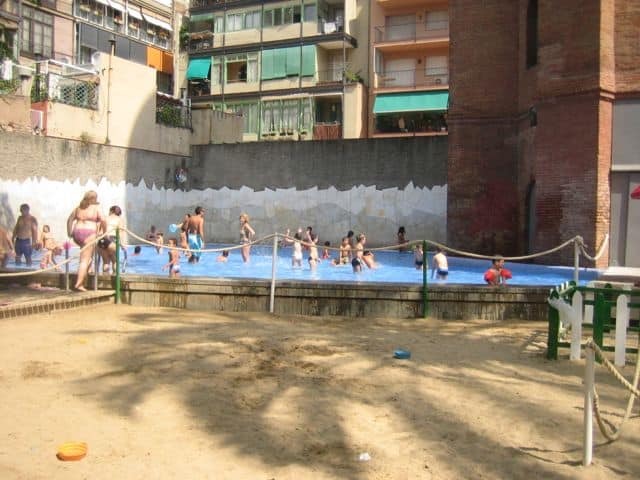 Jardins de la Torre de les Aigües is a fantastic urban public pool and oases open in the summer. Casa Elizalde is a cultural centre with an ideal public outdoor space. Luckily, an organization called Proeixample has taken charge of trying to recover green interiors. When a new part of a block is free, they take the initiative to convert the space into a green public space, where children and elderly people would most benefit. It’s a slow process to wait for an opportunity to arise. 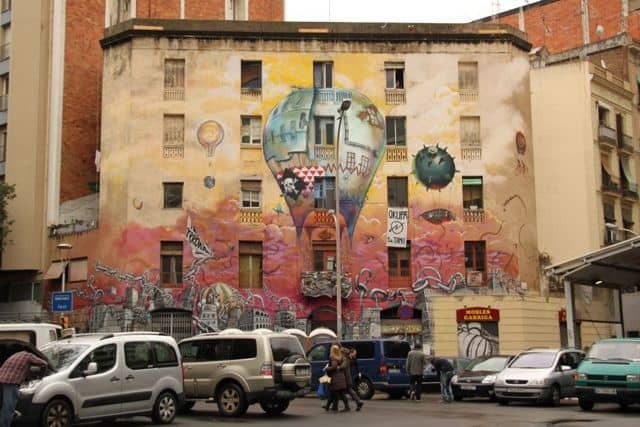 An urban pilot project, a “superilla” is a 9-city block in Barcelona. It’s a 3×3 block closed off to through-traffic (freight trucks, buses, etc.). Cars can drive through it with a speed limit of 10 km/hour. It’s meant to minimize car pollution and noise pollution, foster more walking, outdoor events, and day-to-day neighborhood activity like ping pong tables, benches, and race tracks on the street. 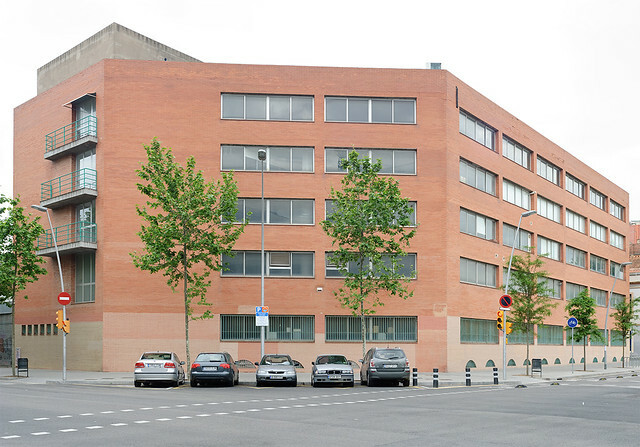 The first implemented Barcelona superblock is in Poblenou. Not everyone was on board because cars have to drive around the perimeter of the superilla, making it inconvenient and annoying. It’s pretty quiet too. You never know what you run into sometimes in the city. Eixample is an emblem of the city: easy mobility where there are schools, hospitals, marketplaces, adding up to a high quality of living. And while much of Cerdá’s original ideas were quashed, his layout prevails. And that is enough for people to call it an urban design model. I originally wrote this post in 2014 because I was fascinated with the city and just updated it for 2019. Why did you check out this article? Tell me in the comments! I learned about Huasmann’s Paris in college. Fascinating article, Justine! Wonderfull piece. By the way, I believe that the Catalan word for a chamfered corner is xamfrà (Castilian: chaflán). Oh didn’t know that! I’ll change it in the post. Thanks! Thanks for citing my article: Cerdà and Barcelona: The need for a new city and service provision. This is a study about the benefit to population social wellbeing obtained by implementing the Cerdà’s Urban Expansion of Barcelona. This is a map recreation of the urban evolution of Barcelona since 1860. Interesting to see how few schools, parks, and markets there were and how they’ve just filled in the gaps as the population has exploded. The grid system must help in planning. Thanks for sharing your work! I have been trying to find any information about the designs on many Eixample buildings. Some appear to be stencils – but some of those are actually reliefs (very difficult to paint). Do you have any info or sources about that? Thank you,Justine, I am from Shanghai. 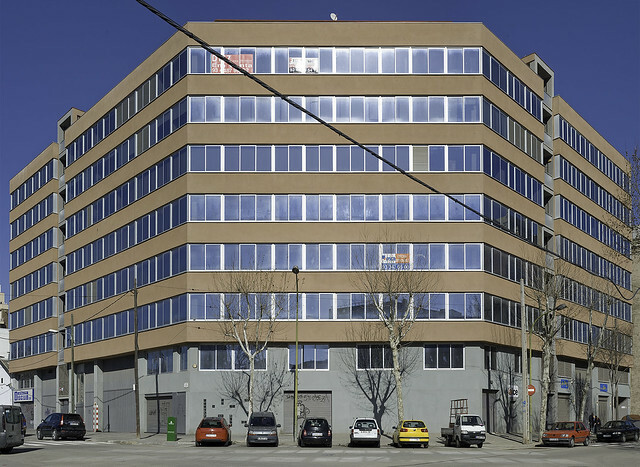 The Eixample, Barcelona is a good example for high-dense development, especially for Shanghai China. 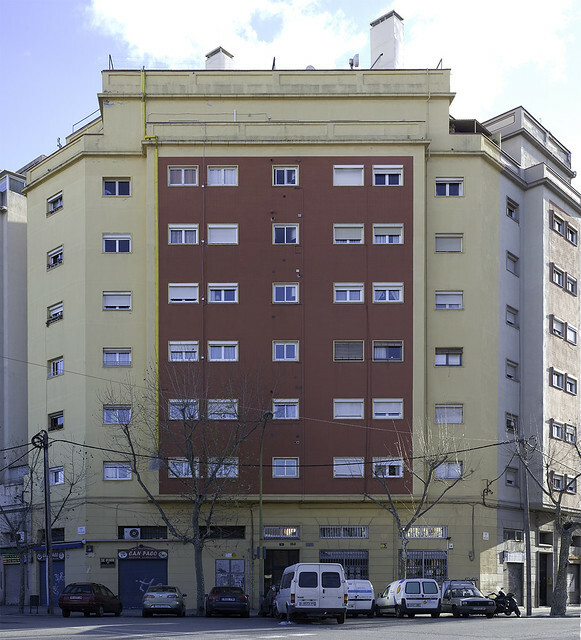 But I don’t think the deep-plan flat buildings in Eixample are suitable for the Barcelona climates, the depth of the buildings reaches 22m-24m. The day-lighting and ventilation are problems, and over-hot inside in summer..
Hi Aimin, I’m not an expert in urban design but I can say – yes, the flats get very hot in the summer. I lived in Eixample and I found it to be true. Not enough ventilation. You don’t get that Mediterranean breeze. Good luck! Thanks for a great article! I just returned from a trip to Barcelona, staying in the Eixample neighborhood and loved it. I’m in the process of writing about it on my own blog “Live Cheap and Make Art USA” and will link this blog to mine on this post for folks to come for this lovely detailed explanation of this area! Gracias! Hey Rosemary, Awesome! Eixample is so lovely. Even though everything looks the same from far away, there’s so much uniqueness when you look closer. I look forward to see the article on your blog!